Pia Miranda at the 2008 Sony Tropfest. 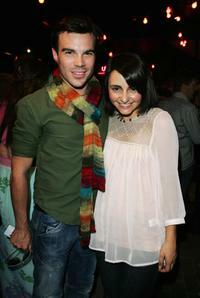 Pia Miranda and Guest at the launch dinner of the 2008 Myer Winter Collection. Pia Miranda at the opening night of 17th Flickerfest International Film Festival. Brett Stiller and Pia Miranda at the premiere of "Toy Symphony." Angus Sampson and Pia Miranda at the Inside Film Awards. Pia Miranda at the premiere of "Hamlet." Pia Miranda at the premiere of "Three Blind Mice." Pia Miranda at the S and B Vie By Sass and Bide catwalk show during the fourth day of the Rosemount Australian Fashion Week. Pia Miranda at the Sydney premiere of "The Black Balloon." Alex Dimitrades and Pia Miranda at the launch of the new Jimmy Choo boutique. Pia Miranda and Guest at the Sydney premiere of "The Dish." Pia Miranda at the premiere of "The Lord of the Rings." Lisa Hensley and Pia Miranda at the 2007 Inside Film Awards nominations announcement. Pia Miranda at the 2007 Movie Extra Filmink Awards. Pia Miranda at the Sass and Bide Denim and Play Launch. Pia Miranda at the L'Oreal Paris 2005 AFI Awards. Pia Miranda at the Myer Autumn/Winter 06 Fashion Show during the L'Oreal Melbourne Fashion Festival. Vince Colosimo and Pia Miranda at the 2005 Lexus Inside Film Awards. Pia Miranda at the Elizabeth Arden Exhibition's "Provocative Women." Pia Miranda at the premiere of "The Unlikely Prospect Of Happiness."